Surfing Jova's waves on Friday | Flickr - Photo Sharing! 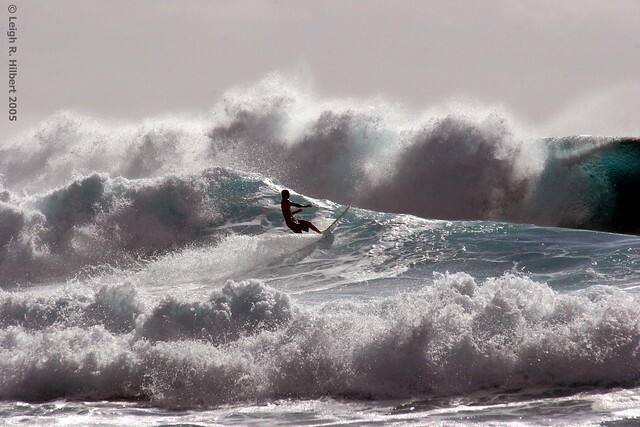 The Hawaiian Islands nearly had a hurricane hit this week. Hurricane Jova turned aside before reaching our shores. Jova’s close visit has created some big and wild surfing waves the last few days. But while we were spared the winds and enjoying the waves here in Hawaii, massive Hurricane Rita, spinning in from the Gulf of Mexico, has made landfall near the Louisiana and Texas boarder, and is now raging inland with strong winds and heavy rains. My heart goes out to those hundreds of thousands in the storms path--especially to those that will be struck a second time as they are still painfully recovering from Hurricane Katrina in New Orleans and surrounding area. Rita could potentially undo all the fragile repairs done to the levees in New Orleans. I sure hope not--they have had more than enough sorrow there for this century. JoshuaDavisPhotography, navidbaraty, and 78 other people added this photo to their favorites. You really caught the brutal force of the waves in this shot !! Awesome wave, sublime in the large version. There is so much detail in the water in the large version! Consider adding this to the Athletes In Action group. I would not be too excited right about that time.. wow man, great one though! that is one big wave that would be cool to go throw it well surfing. only if i could get some of thows waves in utah. but we only have the grate salt lake. i wounder were it is at. i wonder if it could kill you if u went in it. Now that takes courage! What I nice shot. these wave pics are awesome.